Here are some of the images of our upcoming Valentine children's special event. 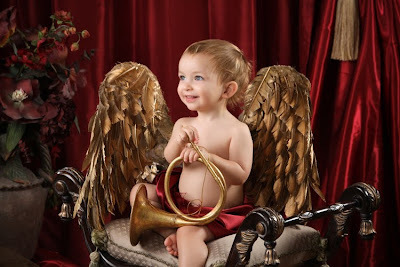 "Little Cupids" will be on FRIDAY FEBRUARY 5th! The colors in this scene are so rich and beautiful! 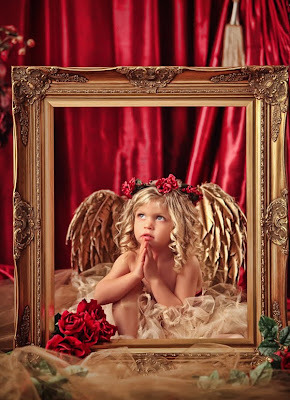 Don't miss out on this never before done Valentine Angel Portraits! Thanks to Devan and Jeffrey (and their parents too) for being awesome models! Here is a little video to put you in the Christmas Spirit! I am sorry I have neglected you over the past few months! Christmas time is a real blur for me and I just haven't had any time to post anything! Please forgive me, I will try to be a better blogger. I have taken MANY family portraits...I have lost count! I have taken MANY portraits of children with Santa Claus and MANY portraits of children without Santa Claus. I have created MANY, MANY Christmas Cards for my clients, all have been AWESOME and will be the talk around the dinner table! I have been busy booking HOME for the HOLIDAYS! In fact, I have completely booked Dec. 26 and have opened up another day on Dec. 27! I only have 2 appointments left! I have been busy booking MAUI! Yes, we are definitely going to MAUI June 4-11th 2010 and already have one family booked and 3 that are working out the details. AND...Trey and I would really like to go to Venice, Italy for a cruise with friends, but the only way we can go is if we book at least one portrait session while we are there. So, all you world travelers, call me ASAP so I can book this trip of a lifetime! Oh yeah, I also went to Paris. Had a blast and I have AMAZING images, just no time to show you, but I will be showing them off soon! Trey and I will be going to Nashville for Imaging USA 2010 where we will be a platform speaker. Our program is The Power of Projection, Jan 10, 6-7:30pm. We will also be giving a studio seminar to professional photographers Feb 21-23. In the middle of that, our nanny resigned and we had to find a new one. Thankfully, we now have a new nanny, Sarah. So, you see, it has been a busy few months. I am BLESSED to be so busy and to have awesome clients, friends and family who help me with my crazy life. May you all have a Blessed Christmas!